Merry McCleary, president and CEO, Avyve Answering a routine, non-descript job-opening ad in the newspaper was the seemingly benign moment that launched Merry McCleary’s 25-year-strong career in the AV industry. Upon learning the job was for copier sales, she politely ended the interview, explaining she just wasn’t interested. That position was with Hughes-Calihan Corporation, which shortly after she joined, was acquired by Lanier Worldwide, a subsidiary of Harris Corporation. Within a year, McCleary was promoted to regional manager for the Presentation Systems Division in the Southeast, overseeing the sales reps in 11 offices. She made the jump from box sales to integration sales at Spectrum Data Systems, where she honed a unique customer-centric business approach to systems integration, more or less spurning traditional sales strategies. At Spectrum, McCleary met Chris Bell, an engineer who was equally aligned with her business concepts, and together they launched Avyve, where she still serves as president and CEO 15 years later. She beams about the “incredible opportunities” she’s had, including her role as one of the few women to have served on InfoComm’s Board of Directors for four years, the last two of which she sat on the executive committee. “It was an amazing experience, and I met some incredible mentors,” she said. Volunteering to give back to the community extends beyond the AV industry for McCleary. Avyve was awarded by NSCA with the Excellence in Business Award for Philanthropic Contributions in 2011. The lobby of Avyve’s new headquarters outside Atlanta. Every year, Avyve contributes 1 percent of annual revenues to non-profit organizations. Over the years, Avyve has contributed to organizations that include the High Museum of Art, Open Hand, Tech Bridge, the Atlanta Symphony Orchestra, the Atlanta Opera, the High Museum of Art, Susan G. Komen Foundation, Lifeline Animal Shelter, the Georgia O’Keefe Museum, TJ Martell Foundation, Children’s Hospital of Atlanta, and others. As the company has grown, so has the level of financial participation from both Avyve and McCleary personally. Avyve has also donated AV systems to the offices of non-profit organizations, and employees are encouraged to participate in charity programs. 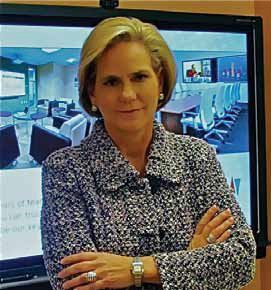 When she’s not ensuring Avyve clients’ best interests are represented in their AV systems design and installation, McCleary is an avid cook, golfer, and traveler. She enjoys spending time in her vacation home in Sante Fe, as well as in Mattapoisett, MA, off of Buzzard’s Bay, where she is the third generation of her family to reside in the home. Lindsey Adler is associate editor of Systems Contractor News, Residential Systems, and Healthcare AV.